At Ashley McGraw Architects, our ambitions encompass creating a regenerative and resilient world where humans live in alignment with, and contribute to, the natural systems all around us. That’s why, when approached by Binghamton University to design a 3,000-ft2 environmental learning and research facility located on a 70-acre nature preserve in Binghamton, New York, we set an ambitious agenda. The Nuthatch Hollow facility is being designed to meet both the Passive House and the Living Building Challenge (LBC) standards. Developed by the International Living Future Institute, the LBC is one of the most aspirational and rigorous holistic building standards in the world today, with only 20 projects to date achieving full certification. Passive House, both the U.S. and the German versions, is based on the need to make drastic energy reductions in our buildings to mitigate the devastating effects of climate change. PHIUS has developed a set of criteria that takes into account climate-specific variations and cost considerations, and we chose to work toward that standard. Understanding and complying with the requirements of these two systems together has required an iterative approach to decision making—reviewing the features of each system, component, and material on multiple levels and evaluating the benefits or disadvantages of the part relative to the whole. Adding to the complexity of the project is a paradox of compliance: In many instances, the guidelines prescribed by PHIUS and LBC are at odds in practice, if not in purpose. Holistically resolving these differences requires a careful patchwork of cross-checked resources and systems. As one example, gas-fired, rather than electric-resistance, water heaters can be a desirable solution for a Passive House, due to their higher energy efficiency; however, LBC prohibits the use of on-site combustion, which necessitates a different approach. To mutually address these guidelines, we chose to locate tankless electric water heaters at the fixtures, which virtually eliminates the potential distribution losses and makes this option a highly efficient one. Although the combination of these standards is complex, we know that the benefits are worth the effort. The energy reduction strategies of Passive House allow us to meet the net positive energy requirement of LBC with the limited area of photovoltaics we can fit on the roof, and provide a level of resilience that will only become more important as time goes on. Finding components and materials that can meet the rigorous thermal and airtightness requirements of Passive House, as well as satisfy the toxicity elimination goals of LBC, is a key part of the process of making a better building and a healthier planet—but it can be an arduous exercise, to say the least. Satisfying LBC’s mandates can require contacting hundreds of manufacturers, reviewing extensive statements of chemical ingredients for LBC’s Red Listed (or worst in class) items, searching for alternative products, and advocating for change in manufacturing processes. At the kickoff meeting for Nuthatch Hollow, we engaged students and faculty to play significant roles in the project, including the intensive task of materials research. The process has evolved over the last 18 months, starting out with a special class built around material research as part of the coursework. The students made the initial contacts with manufacturers of products under consideration and identified manufacturers who were open to adjusting their components to meet the requirements. When the course was completed, the university appointed a student materials-vetting specialist, who has been responsible for researching alternative manufacturers of materials already vetted, to help comply with the public bidding process. The students’ involvement has been a significant learning experience for them as well as a huge help to the design team in making material and component selections, and will continue to be a critical component of the process as we move through construction documents toward bidding this fall. The team has researched materials that can fulfill multiple functions, such as the use of a specific type of wood fiber insulation that serves as a vapor-open weather-resistive barrier in addition to providing insulation value. Because regular truss joist I-beams could not meet the Forest Stewardship Council requirements set forth by the LBC guidelines, sawn lumber joists were used for the roof design instead, with mineral wool batt insulation tightly fitted between structural members, both sourced from nearby Eastern Canada. In an effort to keep the assemblies as foam-free as possible, foam glass gravel made from recycled glass is being considered as an alternative to below-slab rigid foam insulation. Another area where we faced complexity in integrating the two standards was at the washrooms. Living Building Challenge requires net positive water, meaning that the water that falls on the defined LBC project site in the course of a year determines the project’s allowable water use per year, and all wastewater must be processed on site and returned to the environment. Composting toilets are commonly used to help achieve this level of water use reduction, as the composting process allows water to be saved from use as a carriage medium. For this project we are specifying foam flush composting toilets with a composter beneath, which requires continuous ventilation. Exposure to constant airflow is necessary to allow the mixture of toilet waste and bulking material to convert to usable compost and liquid fertilizer. The continuously operating composter fan creates negative air pressure at the toilet fixtures for odor control. Our challenge is to accommodate this continuous exhaust within a balanced ventilation system and still meet the stringent heating limitations of Passive House. At first, we saw two potential solutions to the situation. The first approach would keep the composter ventilation separate from the building’s main ERV by installing a secondary HRV unit to provide dedicated service to the composting toilets. 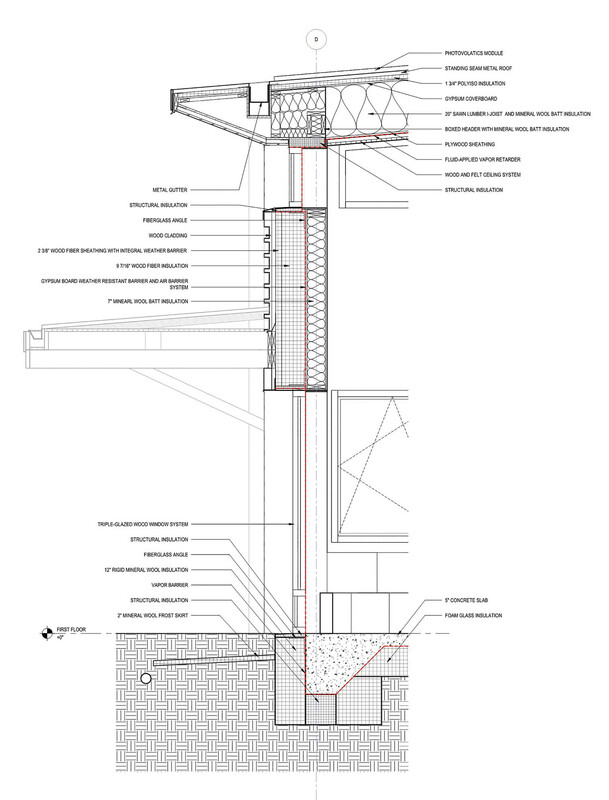 The second approach would integrate the composting toilet exhaust into the overall ventilation system. We ultimately chose the first solution, deciding that the risk of dispersing toilet room odors throughout the entire building was too great. The dedicated HRV will be a very high-efficiency unit that will supply into the washrooms and exhaust directly from the composter unit, thereby containing most, if not all, odors within the washroom ventilation loop. The primary function of Nuthatch Hollow will be as a teaching and research facility for Binghamton University’s environmental studies program. The facility will also be available for other gatherings and may be used during the summer months for community-based educational programs as a hub for collaboration and community engagement. On a symbolic level, the building will act as a physical manifestation of the school’s core values and mission, especially as they relate to preparing students to live effectively in a time of change and actively create a more sustainable, resilient world. Combining standards from these two programs has not been easy, but we hope that by taking on this challenge, we will make the path clearer for others, and that the myriad of sustainable building standards out there will ultimately work together to allow for an integration that’s even greater than the sum of its parts. As we move through this process, we know that with every ambitious project we push toward a future of abundance, symbiosis, and regeneration. Matthew Broderick is president of Ashley McGraw Architects, Nicole Schuster is an associate principal/project architect, and Christina Assmann is a project architect at the Syracuse, New York-based firm.